Yes, I’m still blogging. In case you (I’m assuming at least one person still reads this blog) were wondering, I deliberately stepped away from blogging in December off. I think my self-imposed solitude worked. I will publish the one post I’ve been working on for three months about why I am completely dissatisfied with 2013 films. Lastly, I have enlisted some of my friends to challenge me to do something different with this blog. Like the film nerd equivalent of eating insects. Maybe they will force me to watch something I would never watch. I don’t know what they have planned. But one conclusion I reached during my hiatus is that this blog is http://www.cine-fille.com. Maybe it is time I focused more on the “fille” part than just the “cine” part. Who knows if I will actually complete any of these resolutions. I am terrible at following through with the goals I set for myself. So in the meantime, just know that yes, I’m still blogging and yes, I’m still here. 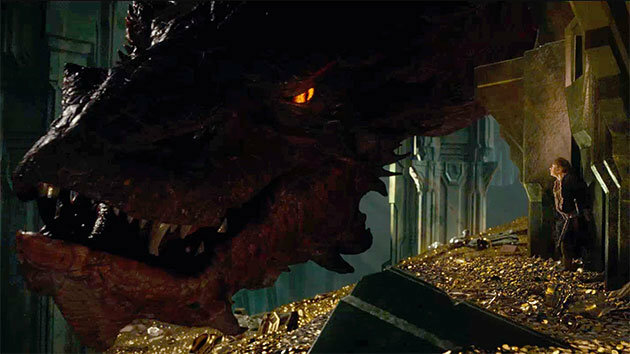 Like Smaug, the evil Liberace of dragons, I’m not going away any time soon. Good! Would be sad if this blog went away! Happy New Year!